Matheson CD, Vernon KK, Lahti A, Fratpietro R, Spigelman M, et al. 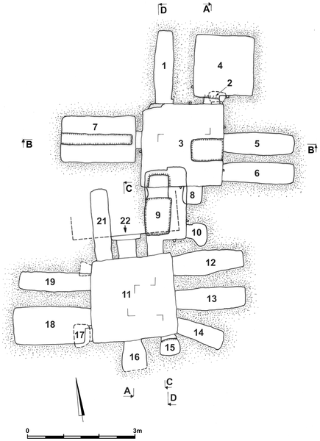 A schematic plan of the tomb (numbers represents the niche or loculi) (Produced by SG). The Tomb of the Shroud is a first-century C.E. tomb discovered in Akeldama, Jerusalem, Israel that had been illegally entered and looted. The investigation of this tomb by an interdisciplinary team of researchers began in 2000. More than twenty stone ossuaries for collecting human bones were found, along with textiles from a burial shroud, hair and skeletal remains. The research presented here focuses on genetic analysis of the bioarchaeological remains from the tomb using mitochondrial DNA to examine familial relationships of the individuals within the tomb and molecular screening for the presence of disease. There are three mitochondrial haplotypes shared between a number of the remains analyzed suggesting a possible family tomb. 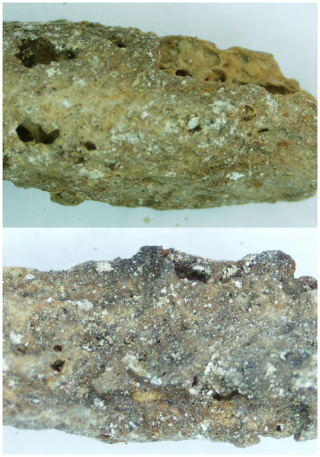 There were two pathogens genetically detected within the collection of osteological samples, these were Mycobacterium tuberculosis and Mycobacterium leprae. The Tomb of the Shroud is one of very few examples of a preserved shrouded human burial and the only example of a plaster sealed loculus with remains genetically confirmed to have belonged to a shrouded male individual that suffered from tuberculosis and leprosy dating to the first-century C.E. This is the earliest case of leprosy with a confirmed date in which M. leprae DNA was detected. The phalanx with suspected pathology (Photograph taken by KKV).